A journey is synonymous with finding meaning. You should use your CRM platform to design captive journeys that enable prospects to find meaningful resolution to their needs. Simply put, a customer journey is targeted interaction between business and prospects or customers. It can make a purchase experience memorable or disastrous. How to make it the former one? Read on to find out. Traditionally customer interactions are recorded in separate systems. This leads to window hopping for agents that in turn result in long resolution times. often, with low accuracy. Financial CRM changes that. It stitches interactions in a single platform, visible in a single screen. The single window has action items with automated processes for servicing, cross selling etc. Thus, ensuring faster service and sales cycle. A customer journey is a path that captivates attention and wallets. with the help of visual modelers powered by CRM in financial services, you can design and deploy visual journeys that capture customer information, intelligently profiles and score them on your lead management in CRM. Alternately, implement them for handling customer issues like blocking cards, loan application with instant approval etc. An auto financial services firm designed a customer journey using automated processes that resulted in loans in 3 minutes, significantly boosting conversions. That's a testament to the power of visual journeys! A delightful journey is not possible without taking multiple aspects into considerations. Similarly, creating customer journeys will not be possible without seamless integrations. A CRM software can now help run integration jobs without codes with drag and drop functionality. Faster and cleaner integrations are now possible with automated integrators. Not all channels are created equal. Web will take precedence over other engagement channels for some businesses, phone for others. Analyze interaction sources captured in CRM systems to find which channel contributes the most. Use this intelligence to create custom campaigns that derives maximum value from the channel. Avoid bracketing many channels as important. It only makes analysis complicated. A single driver cannot handle the arduous task of designing the greatest journey. Bring in all the stakeholder and create a steering group that drives customer acquisition and nurturing strategies through journeys. The said group can include IT, marketing, merchandising, sales, customer service, business operations, analytics etc. This will ensure a holistic overview taking all factors into consideration. But remember to appoint an experienced head to guide cohesion amid different opinions. 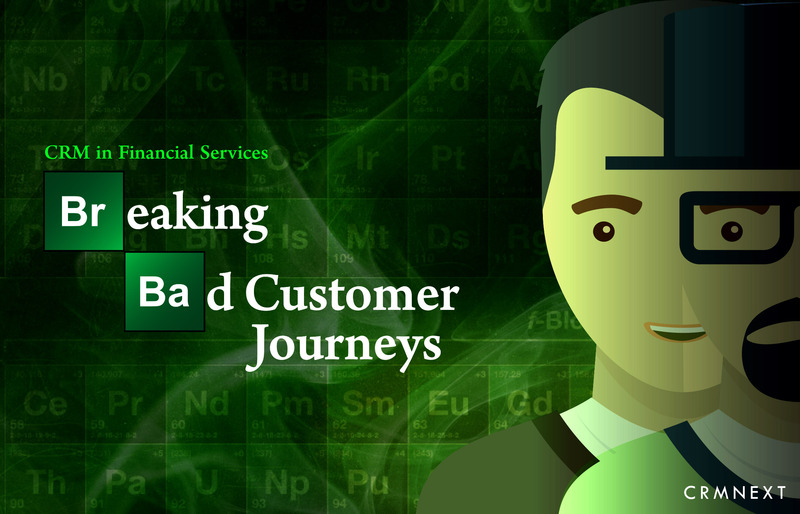 Breaking bad customer journeys in financial services and replacing them with delightful ones will bring you enormous rewards in the form of greater customer retention, margins and goodwill. That too, without 'breaking the law'.